1913, Budapest, in the heart of Europe. The young Irisz Leiter arrives in the Hungarian capital with high hopes to work as a milliner at the legendary hat store that belonged to her late parents. She is nonetheless sent away by the new owner. While preparations are under way at the Leiter hat store to host guests of uttermost importance, a man abruptly comes to Irisz, looking for a certain Kálmán Leiter. Refusing to leave the city, the young woman follows Kálmán’s tracks, her only link to a lost past. “Béla Tarr may have retired, but Hungarian cinema has found a worthy standard-bearer in László Nemes. 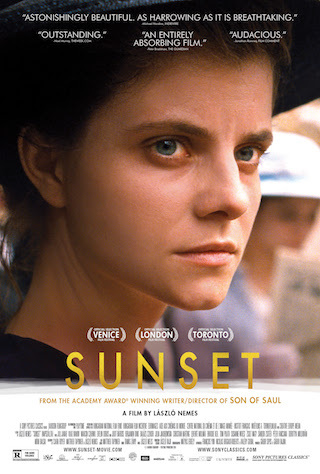 Sunset confirms the Oscar-winning Son of Saul director as a major talent, one whose sophomore feature is both astonishingly beautiful and profoundly sorrowful: It unfolds like a cross between a memory and a dream, the kind so vivid you’ll swear it was real as you hang on to every half-remembered detail.” IndieWire.